An international collaboration came together in the construction of a new river pusher tug. Concordia of the Netherlands designed the RP6000 tug for the Japanese and South American owned Astillero Tsuneishi Shipyard, using Nautican high-efficiency nozzles and Nautican’s triple-rudder design. 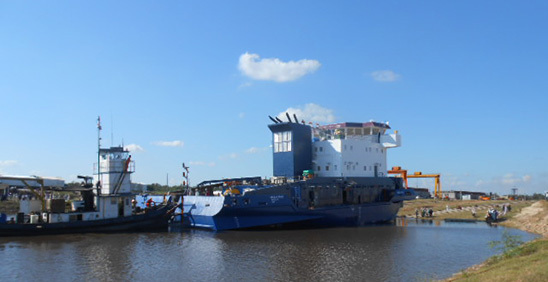 This is the first tug for the Astillero Tsuneishi Shipyard, established in a remote region of Paraguay in 2008. The tug was developed specifically for the shallow waters of the region and can traverse waters up to 1.85 meters deep while transporting up to 40,000 tons. The tug represents not only an expansion of the yard’s capabilities, but also a significant move forward for the South American economy and the marine services industry. South America is a country rich in resources. The vast majority of these resources – agricultural and mining – are in the interior of the country, resulting in a high percentage of all goods needing to travel by water. While resource production is possible inland, companies are constrained by a lack of vessels to transport the cargo to the coast for global export. Before the construction of the pusher tug, the Astillero Tsuneishi Shipyard was focused on building river barges. In a market with such high demand for river vessels and limited ability to produce such vessels, Astillero Tsuneishi has proven their ability to efficiently deliver quality construction. Nautican worked in coordination with the vessel designer and shipyard to provide the components. Nautican’s past success with the refit of pusher-towing tug, Edgar Kotokak, and the proven performance gains of Nautican nozzles, propellers and triple rudders, convinced the designer and owner to choose Nautican. The new South American pusher tug launched successfully in May 2015, and is expected to enter service in the summer. A second set of Nautican components has been delivered for the construction of a sister ship, currently underway at the yard.